NCERT Textbook Solutions are considered extremely helpful when preparing for your CBSE Class 9 Mathematics exams. TopperLearning study resources infuse profound knowledge, and our Textbook Solutions compiled by our subject experts are no different. Here you will find all the answers to the NCERT textbook questions of Chapter 10 - Circles. All our solutions for Chapter 10 - Circles are prepared considering the latest CBSE syllabus, and they are amended from time to time. Our free NCERT Textbook Solutions for CBSE Class 9 Mathematics will strengthen your fundamentals in this chapter and can help you to score more marks in the examination. Refer to our Textbook Solutions any time, while doing your homework or while preparing for the exam. (iii) The longest chord of a circle is a diameter of the circle. (iv) An arc is a semicircle when its ends are the ends of a diameter. (v) Segment of a circle is the region between an arc and chord of the circle. (vi) A circle divides the plane, on which it lies, in three parts. (i) True, all the points on circle are at equal distance from the centre of circle, and this equal distance it called as radius of circle. (ii) False, on a circle there are infinite points. So, we can draw infinite number of chords of given length. Hence, a circle has infinite number of equal chords. (iii) False, consider three arcs of same length as AB, BC and CA. Now we may observe that for minor arc BDC. CAB is major arc. So AB, BC and CA are minor arcs of circle. (iv) True, let AB be a chord which is twice as long as its radius. In this situation our chord will be passing through centre of circle. So it will be the diameter of circle. (v) False, sector is the region between an arc and two radii joining the centre to the end points of the arc as in the given figure OAB is the sector of circle. (vi) True, A circle is a two dimensional figure and it can also be referred as plane figure. A circle is a collection of points which are equidistant from a fix point. This fix point is called as the centre of circle and this equal distance is called as radius of circle. And thus shape of a circle depends on the radius of the circle. So, if we try to superimpose two circles of equal radius, one each other both circles will cover each other. Hence equal chords of congruent circles subtend equal angles at their centres. Hence, if chords of congruent circles subtend equal angles at their centres then chords are equal. Consider the following pair of circles. (i) circles don't intersect each other at any point, so circles are not having any point in common. (ii) Circles touch each other only at one point P so there is only 1 point in common. (iii) Circles touch each other at 1 point X only. So the circles have 1 point in common. 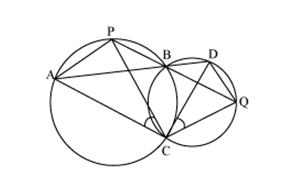 (iv) These circles intersect each other at two points P and Q. So the circles have two points in common. We may observe that there can be maximum 2 points in common. We can have a situation in which two congruent circles are superimposed on each other, this situation can be referred as if we are drawing circle two times. Step1. Take the given circle centered at point O.
Step2. Take any two different chords AB and CD of this circle and draw perpendicular bisectors of these chords. Step3. Let these perpendicular bisectors meet at point O. Now, O is the centre of given circle. Consider two circles centered at point O and O' intersect each other at point A and B respectively. Join AB. AB is the chord for circle centered at O, so perpendicular bisector of AB will pass through O. Again AB is also chord of circle centered at O', so, perpendicular bisector of AB will also pass through O'. Clearly centres of these circles lie on the perpendicular bisector of common chord. Let radius of circle centered at O and O' be 5 cm and 3 cm respectively. OO' will be the perpendicular bisector of chord AB. Let PQ and RS are two equal chords of a given circle and there are intersecting each other at point T. Draw perpendiculars OV and OU on these chords. chords PQ and RS are congruent to each other. Let PQ and RS are two equal chords of a given circle and there are intersecting each other at point T.
Draw perpendiculars OV and OU on these chords. OTV = OTU (by CPCT) Hence, the line joining the point of intersection to the centre makes equal angles with the chords. Let us draw a perpendicular OM on line AD. Here, BC is chord of smaller circle and AD is chord of bigger circle. We know that the perpendicular drawn from centre of circle bisects the chord. Draw perpendiculars OA and OB on RS and SM respectively. RC = 4.8 RM = 2RC = 2(4.8)= 9.6 So, distance between Reshma and Mandip is 9.6 m.
OA (radius) = 20 m.
Medians of equilateral triangle pass through the circum centre (O) of the equilateral triangle ABC. We also know that median intersect each other at the 2: 1. As AB is the median of equilateral triangle ABC, we can write AB = OA + OB = (20 + 10) m = 30 m.
So, length of string of each phone will be m.
We know that angle subtended by an arc at centre is double the angle subtended by it any point on the remaining part of the circle. OAB is an equilateral triangle. So, angle subtended by this chord at a point on major arc and minor arc are 30o and 150o respectively. Consider PR as a chord of circle. Take any point S on major arc of circle. Here, each interior angle of cyclic quadrilateral is of 90o. Hence it is a rectangle. This equation shows that the opposite angles are supplementary. So, ABCD is a cyclic quadrilateral. ABD and PBQ are line segments intersecting at B. Two circles are drawn while taking AB and AC as diameter. Let they intersect each other at D and let D does not lie on BC. Hence BDC is straight line and our assumption was wrong. From equations (3) and (4), we can see that quadrilateral ABCD is having sum of measures of opposite angles as 180o. So, it is a cyclic quadrilateral. Let ABCD be a cyclic parallelogram. Parallelogram ABCD is having its one of interior angles as 90o, so, it is a rectangle. Let two circles having their centres as O and intersect each other at point A and B respectively. So, line of centres of two intersecting circles subtends equal angles at the two points of intersection. Let ABCD be a rhombus in which diagonals are intersecting at point O and a circle is drawn taking side CD as its diameter. We know that angle in a semicircle is of 90o. So, point O has to lie on the circle. For a parallelogram opposite angles are equal. Let two chords AB and CD are intersecting each other at point O. AD = CB (by CPCT) Since in quadrilateral ACBD opposite sides are equal in length. Hence, ACBD is a parallelogram. As ACBD is a parallelogram and one of its interior angles is 90o, so it is a rectangle. A is the angle subtended by chord BD. And as A = 90o, so BD should be diameter of circle. Similarly AC is diameter of circle. AB is common chord in both congruent circles. Let perpendicular bisector of side BC and angle bisector of A meet at point D.
Let perpendicular bisector of side BC intersects it at E.
Perpendicular bisector of side BC will pass through circum centre O of circle. Now, BOC and BAC are the angles subtended by arc BC at the centre and a point A on the remaining part of the circle respectively. We also know that the angle subtended by an arc at the centre is double the angle subtended by it at any point on the remaining part of the circle. It is possible only if BD will be a chord of the circle. For this the point D lies on circum circle. Therefore, the perpendicular bisector of side BC and angle bisector of A meet on the circum circle of triangle ABC. TopperLearning provides step-by-step solutions for each question in each chapter in the NCERT textbook. Access Chapter 10 - Circles here for free.